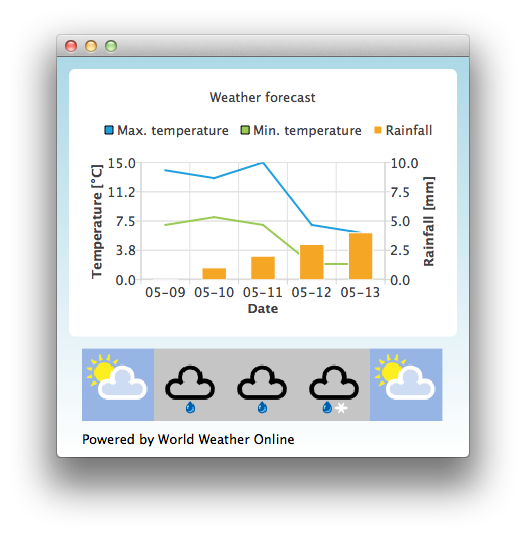 By default the application uses static test data to mimic a weather forecast. You can also obtain an application id from http://www.worldweatheronline.com/ to get access to weather API provided by World Weather Online. You can then give your application id as a parameter to the Qml Weather executable to make it use live data. To get data with weather forecast data, we make an HTTP GET request to World Weather Online. We request the response in JSON data format. // Store temperature values, rainfall and weather icon. // synchronized with the rainfall bars.